Are you an artist or photographer? Do you sell prints of your artwork? Then you will not want to miss our new MiMo Semi-Archival™ Mounted Prints! Neatly filling the gap between postcard prints and larger Giclée prints, these mini art prints are ideal for selling at craft fairs, in gift shops, or from your own online store. 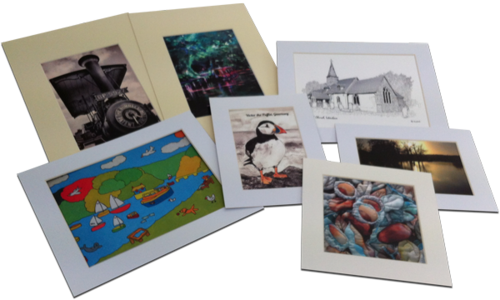 These mounted prints have been designed to fit into standard UK sized frames - ideal if you sell your artwork online or at craft fairs! With aperture sizes measuring from 145mm x 145mm, A5, A6 and 5x7, these mini mounted prints make excellent gifts. Our MiMo prints are also great for selling to browsers at craft fairs or art markets. They are printed on a choice of two acid-free, heavyweight papers fromFedrigoni using our in-house process. So whether you’re a photographer, artist or illustrator, your artwork will look stunning and be colour-fast for around 30 years! Although these mini mounted prints cannot be classified as Giclée quality, they are a less expensive alternative to fully archival prints. Our MiMo Prints have been tested to last 20 to 30 years without fading; hence the term ‘semi-archival’. Because we know you’d rather spend your time creating artwork or taking photos, we supply your miniature prints already mounted on a choice of textured ivory or white mount board. We also pack each mounted print in its own clear cellophane bag. All you have to do is price your prints and they’ll be ready to sell! What’s more, we are offering free shipping (within the UK) on our MiMo Semi-Archival™ Mounted Prints – but for a limited time only! So if you’re thinking of selling prints of your artwork now is the time to order.